Wall's is launching a 'pay by emoji' ice cream van in south London on 16 July, to promote the brand's new 'Snackable' range. As well as promoting its new snack-sized products, Wall's will also be using the stunt to celebrate National Ice Cream day. The van - which itself will also be snack-sized to match the new range - will offer passers-by in Clapham Common the chance to receive free ice cream. Wall's will be offering up its latest flavours and products to guests who come across the mini ice cream van, including the Feast Sandwich, the Solero Strawberry Smoothie and the Wall's Duo. 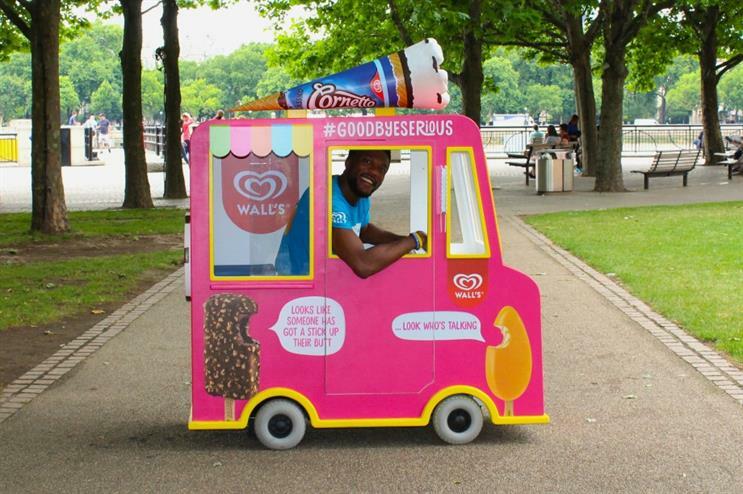 The van will appear in Clapham Common from 11am - 4pm, and passers-by can claim their free ice cream by tweeting the 'secret code' along with the hashtag #GoodbyeSerious to the brand's Twitter page. More: In June, Gin Mare opened a G&T ice cream parlour to celebrate World Gin Day. Also last month, Food Network toured its Ice Dream Van around London encouraging Londoners to rediscover their childhood.